Our house is just outside the town. You actually get the impression to be in the countryside, and not so close to the town, as the house is surrounded by meadows and olive trees. The house has a garden of about 3000 square metres. It is used for growing vegetables, but there are also trees and flowers. In the part of the garden close to the house there are pine trees that offer an especially pleasant place in the shade. 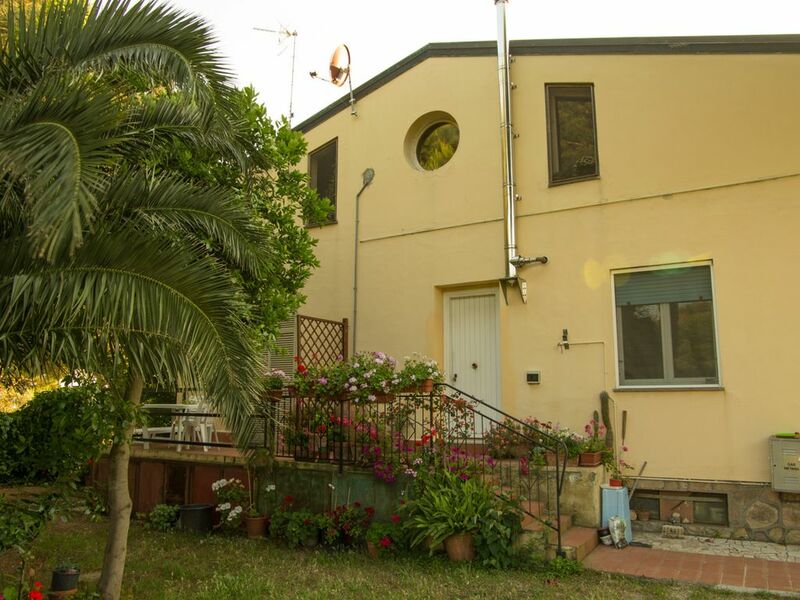 The house was expanded about ten years ago - now the flat on the first floor is let to tourists that appreciate the location of the house und like Piombino because it is not a purely touristical place. By the way: We live on the top floor. The garden is ideal for children to play in and also for parents who would like to enjoy the sunshine or the shade, just as they prefer. There is also a terrace on which you can eat outside. Es war super, wir kommen immer wieder !! Die Wohnung ist wunderschön, wir fühlen uns dort wie Zuhause . Der Garten ist super... man kann dort ganz ungestört relaxen, grillen und den Sonnenuntergang genießen. 5-10 min. mit dem Auto zum Meer runden die Sache ab. En unvergessliches und für uns immer wiederkehrendes Erlebnis. Alles in allem so schön dass wir 2015 unsere Silberhochzeit dort feiern werden. Vielen Dank für die Gastfreundschaft, wir sehen uns ! Die Ferienwohnung war in sauberen und guten Zustand. Wir haben uns ohne Probleme eingelebt und im Umfeld gut zurechtgefunden, sodass wir den oben wohnenden Vermieter nicht belästigen mussten. Obwohl die Wohnung sehr ruhig außerhalb gelegen ist, erreicht man das Zentrum Piombinos, in ca. 10 Minuten mit dem PKW. Wir haben uns auf jeden Fall sehr wohl gefühlt und würden jederzeit wiederkommen. Piombino is a town at the Tuscan coast, opposite the island of Elba. Piombino itself has a lovely beach bay called Calamoresca. Surrounding Piombino there are several sandy beaches, two of them stretching for miles. To the north there is the Etruscan Populonia with Etruscan museum and tombs to visit and the famous bay of Baratti. To the south of Piombino there is the Parco Costiero della Sterpaia, a coastal nature reserve, which is great for walking or cycling. Behind that stretches the Maremma, a rural area that has preserved its rough and rustic character. Piombino has a picturesque historic town centre with little shops, restaurants and wine bars. Here you can sit outside, dine well, relax and enjoy the Mediterranean atmosphere. Passing by the renaissance town hall you soon find yourself on a town square built on top of the cliffs high above the old fishing harbour. Here people take a stroll and look at the great expanse of the sea. The view of the island of Elba is spectacular. Die Preise gelten für bis zu sechs Personen. In den Wochenpreisen sind inbegriffen: Strom-, Wasserverbrauch, Gasverbrauch zum Kochen.